What does Awaiting Confirmation mean? From any screen, click the blue CREATE in the top left corner of the screen. Note: After clicking Add, the network partner's company name will show as Awaiting Confirmation. The first time a partner enters Emerge, the partner will be asked to confirm their contact information. 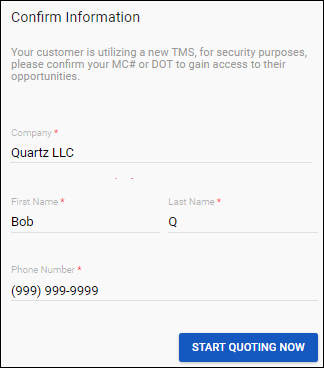 Company Name: network partners will use their MC#, DOT# or their company name and select from a drop down menu. The partner will then click START QUOTING NOW to submit the confirmation and is now ready to enter rates!